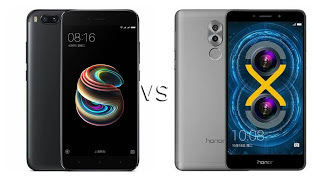 Xiaomi launched Mi 5X Mid range smartphone with a 12MP Dual Rear camera in China.Honor 6X also comes with a Dual Rear camera.Check out Price, Specs, Features Comparison between Xiaomi Mi 5X and Honor 6X. Both Phones comes with a Metal body and Fingerprint Scanner. On Display, both phones have a 5.5-inch Full HD Display. Xiaomi Mi 5X is powered by 2.0 GHz Octa-Core Snapdragon 625 Processor with 4GB RAM and 64GB internal storage. Xiaomi Mi 5X comes in Black, Gold and Rose Gold colors priced at 1499 Yuan.The Honor 6X comes in gold, silver and gray colors and is priced at Rs. 11,999 for the 3GB RAM with 32GB storage version, while the 4GB RAM with 64GB storage version costs Rs. 13,999.No Details if Xiaomi will launch Mi 5X in India, Xiaomi should launch Mi 5X in India under Rs 14000.